The 38" Rebounder with resistance tubes, and electronic monitor is a fun way to build cardiovascular fitness, tone your legs, abs, buttocks, and back, have more energy, rev up your metabolism, and just feel, look, and be fit. The larger rebounding surface adds stability and more exercise options. The resistance tubes let you focus on building strength in your arms, shoulders, back and chest. The blue outline adds safety by keeping you bouncing inside the mat's 'sweet spont' area. The 38" Rebounder takes up a small amount of space and is easy to store out of the way when not in use. Optic blue border to help keep your workout safe. 38 wide sturdy steel frame. Exercising properly is important because being physically fit lessens the risk of developing health problems. Get a full-body workout in a safe and fun way with the Marcy Cardio Trampoline Trainer! 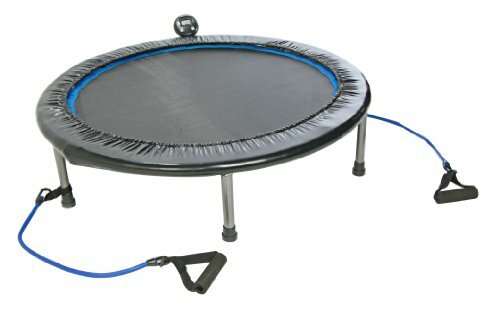 Ideal for men and women alike, this trampoline trainer has a compact design that allows it to fit into small spaces. It can be used at the gym or even at home. It is also portable, so you can easily carry it and move it around. The trampoline is well-constructed and has six supporting legs and continuous rebound bands that can support up to 250 pounds. Have fun with your aerobic and cardio workouts without compromising your safety! You don t have to worry about the impact of this workout on your knees and joints, since the springy nature of the trampoline is gentle on the joints and offers excellent energy rebound. 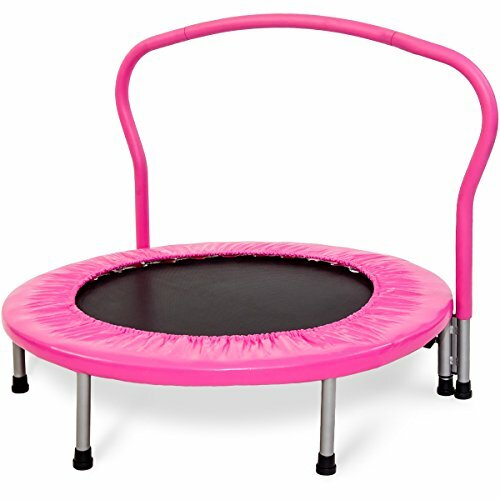 This mini-trampoline even has a built-in safety bar that you can use for increasing your balance, coordination, and flexibility. Jumping up and down on this trampoline trainer will help you burn calories, lose weight, and tone your upper and lower body in a fun and exciting way. Jumping on a trampoline works out a wide range of muscle groups in the body, such as the cardiac and skeletal muscles, and it helps build muscle mass and strengthens the shoulder, hip, and leg muscles. Moreover, trampoline workouts boost overall cardiovascular health and minimize the risk of heart disease. A wide variety of exercises and intensity levels can be added to increase your strength-training sessions and allow you to get the maximum benefits from this exercise routine. 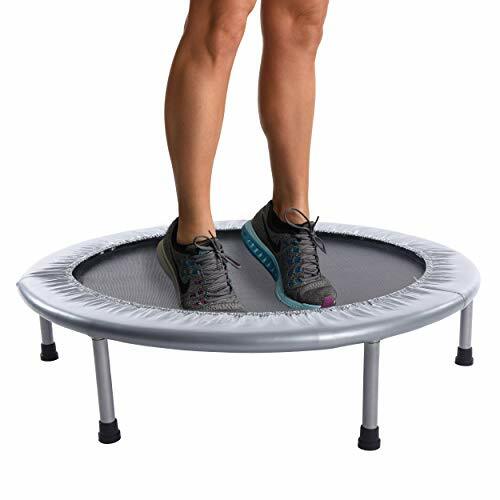 Bounce your way to a healthier you with the Marcy Cardio Trampoline Trainer! Enjoy a safe, invigorating cardio workout without impacting your knees and joints with the Marcy Trampoline Trainer. The trampoline is well constructed, with six supporting legs and continuous rebounding bands that support up to 250 pounds. Once you step on the trampoline, you'll start working out and strengthening a wide range of muscle groups, including the leg, hip, and shoulder muscles (the trainer includes a removable stability handle). Trampoline training also strengthens the skeletal and cardiac muscles while boosting cardiovascular health and minimizing the risk of heart disease. And there's no restriction on your workouts. You can start slow and then add a variety of exercises and intensity levels to maximize your fitness routine. COMPACT AND PORTABLE - The Marcy Cardio Trampoline Trainer is both compact and portable. Itis designed to fit small spaces in the gym or at home, and its convenient size lets you carry it from one spot to another without any hassle. SAFE AND FUN - Trampoline workouts are ideal for men and women alike. If you want to start getting fit or if you've been working out for some time now and just want a new routine, you should try trampoline training! INCREASES BALANCE AND COORDINATION - Trampolines work out a wide range of muscle groups, such as the cardiac and skeletal muscles. They help build muscle mass and strengthen the shoulder, hip, and leg muscles. ENHANCES HEART RATE AND BURNS CALORIES - One advantage of this trampoline trainer is that it boosts cardiovascular health. It increases the heartrate and minimizes the risk of cardiac disease. UNIQUE AND DURABLE -A variety of exercises and intensity levels can be added to increase your strength training sessions and get the maximum benefits from your exercise routine. This trampoline has a durable construction and can support up to 250 pounds. Exercise your playfully at the same time to improve your endurance and coordination, balance and agility. With this trampoline fitness you can burn it at home with no danger and up to 15 kcal per minutes. The trampoline is available in a variety of sizes and styles. Assembly Instructions (English) Ideal for your fitness, exercise and outdoor fun. Edge protection brings more safety to your Ultransport. Whilst the trampoline is so easy to hold on to, it is comfortable to take with you. 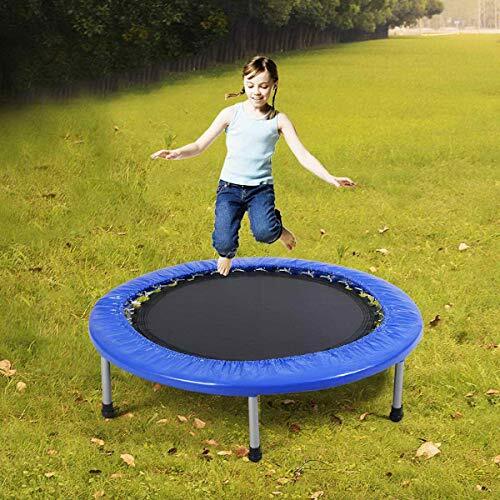 Have the trampoline with a strong spring design makes it easy to have fun in your garden. [ Non-Slip and Amazingly Quiet in Use ] - With unique design to improve the rubber caps and bounce mat, mini bouncer will be well kept in place and providing more stable and safer bouncing experience and thus also makes it possible for kids age 10+, under adults guardianship, to do cardio workout. It also effectively reduce noises by optimizing the trampoline mat. [ Special Rust-Proof Steel & Enhanced Springs ] - Thanks to the constant research in quality materials and manufacturing processes, fitness trampoline could withstand long lasting use without rust or out of shape. 32 enhanced springs and 6 durable & firm stainless steel legs ensures the maxium weight capacity support up to 220 lbs. 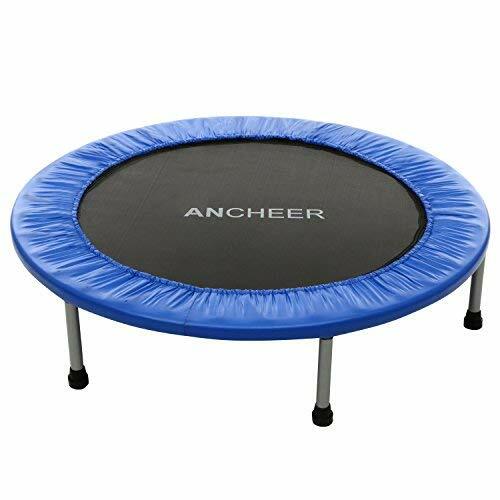 [ Foldable & Easy to Carry ] - ANCHEER mini trampoline is unique designed for folding, which is perfect for living room, bedroom, office or other limited space etc. With the folding design, it can be folded twice or once, saving you much storage space and carrying your trampoline from one room to the other will be more easier. [ Why Should We Chose Springs Trampoline ] - Comparing to other forms of exercise, trampoling is easy on the Joints and it only require limited space and could save you alot of time. It aslo burn calories more effetively. Training your balance and coordination are also very important and essential in body building. [ Compact & Easy Assemble ] - The springs are all pre-assembled, you just need assemble the pad and leg tubes. Even one person could finished the assembly in a real short time. 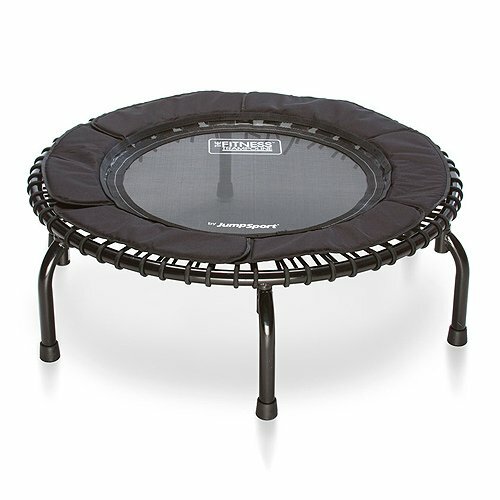 The Pure Fun 40" Mini Rebounder Trampoline provides an excellent low-impact cardio exercise option. Exercising on mini trampolines is proven to be effective in boosting cardiovascular health while reducing the strain on joints. Exercising regularly with this trampoline trainer will help to develop and tone leg and core muscles. The exterior trampoline pad is cushioned to avoid injuries if bouncing out of control brings the bouncer too close to the springs. This trampoline is constructed with 30 high tension dual-springs and steel rubber-tipped supports which make this trampoline sturdy and durable with a weight capacity of 250 lbs. 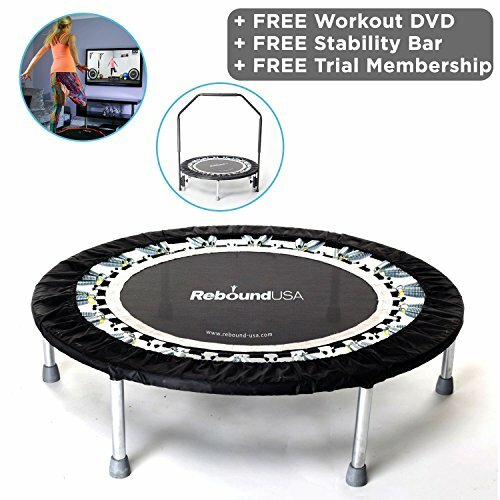 Mini rebounder trampolines are excellent for cardio exercise routines as they are gentle on joints. Regular cardiovascular exercise at a sustained elevated heart rate helps to minimize the risk of cardiac disease while engaging and strengthening muscles and balance. The jump mat is made of heavy-duty polypropylene to ensure sustained bouncing and elasticity. 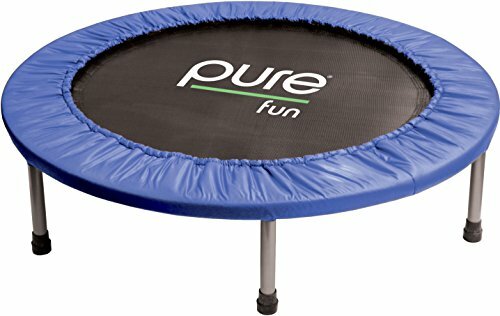 The Pure Fitness 40" Mini Rebounder Trampoline is quick and easy to assemble and no additional tools are required. Contains 30 high-tension dual spring system, making it sturdy and durable with a weight capacity of 250 lbs. THE CHOICE OF PROFESSIONAL FITNESS INSTRUCTORS and gyms across the world for higher intensity workouts. See the commercial classes videos! ALMOST FULLY ASSEMBLED! Be bouncing within minutes of opening the box. Just attach the easy-on legs and go. BUILT EXTRA TOUGH with our strongest frame for the rigors of group fitness and personal training, as seen in gyms everywhere, providing a roomy safe exercise platform. PATENTED PADDED PETAL SKIRT COMFORTABLY EXPANDS WORKOUT AREA whether standing, sitting or reclining. The 250 comes with our exclusive Padded Petal Skirt which moves with your bounce and provides a larger more comfortable surface for varied exercises like abdominal and leg lift work. NO-TIP PATENTED ARCHED LEGS lets you safely jump with stability and confidence. Frame is sealed and protected with a tough, durable 2-coat, striking black finish for lasting durability. These technologies combine for our smoothest, most cushioned, exhilarating bounce helping you feel buoyant and happy! CYCLE-TESTED TO HUNDREDS OF THOUSANDS OF BOUNCES. You get 30 of our premium (8mm) EnduroLast 2 cords cycle-tested to 400 thousand bounces, 3 to 4 longer life than all competitive products. NO SQUEAK SILENT BOUNCING! The virtually silent bounce allows you to use this anytime, day or night. Maximum user weight rating of 225 pounds. JUMPSPORT IS A SMALL, USA, FAMILY-OWNED, 20 YEAR-OLD BUSINESS. Our founder, Mark Publicover, known as The Father of Trampoline Safety, is the inventor of the trampoline safety enclosure that protects millions of bouncing kids around the world every day. JumpSport is the industry-leading innovator in trampolines. Feel good about buying the highest quality products available. Patented padded petals cover cords for added safety and provide over 60% more exercise space. Kids have endless energy to burn, and this Merax trampoline is a great choice for them to burn off extra energy. As they work out their whole body, kids will develop better fitness, balance, and coordination. This trampoline has a large jumping surface to help provide stability for young bouncers. The full gripped handle bar bar helps them stay upright and makes it more safe. 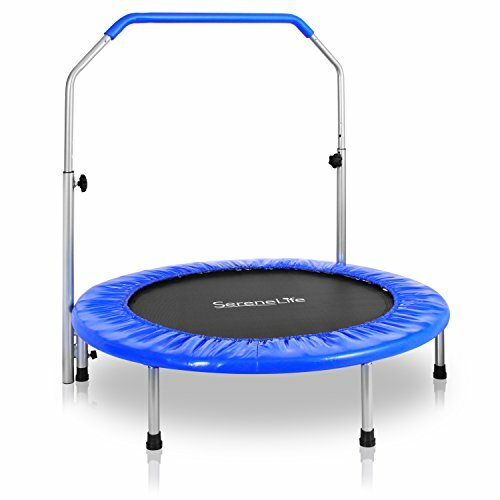 Your child can have great indoor fun on this sturdy trampoline. It can suppport up to 180 lbs and can accompany your children for a long period of time. Sports Adult Size Trampoline Features: Highly Elastic Sports Trampoline Jumping Mat made of PP Secured with Coil Spring Sturdy Steel Rust Proof Powder Coated Frame Padded PVC Cover Provides Safer Jump Surface Space Saver, Folds Away Easily with Free Kitbag Adjustable and Padded Handrail for Easy Grip Ideal for Losing Weight as you Jump your Carbs Away Technical Specs: Assembled Size: 40 x 35-46 (from ground to top) Jumping Mat: Polypropylene material 29.3 Handrail Height: Adjustable, 35 to 46 Frame Cover: PVC material Maximum Load: 220 lbs. *Assembly Required The SereneLife Sports Adult Size Trampoline - Highly Elastic Sports Trampoline - Jumping Mat made of PP Secured with Coil Spring - Sturdy Steel Rust Proof Powder Coated Frame - Padded PVC Cover Provides Safer Jump Surface - Space Saver, Folds Away Easily with Free Kitbag - Adjustable and Padded Handrail for Easy Grip - Ideal for Losing Weight as you Jump your Carbs Away - Technical Specs: - Assembled Size: 40 x 35-46 (from ground to top) - Jumping Mat: Polypropylene material 29.3 - Handrail Height: Adjustable, 35 to 46 - Frame Cover: PVC material - Maximum Load: 220 lbs. - *Assembly Required. The Stamina InTone Oval Jogger with upper body cords, padded handlebar and electronic monitor is a fun way to work out. You will improve your cardiovascular fitness while you tone your legs, abs, buttocks, back, shoulders, arms, and core. Plus have more energy, feel, look, and be fit. The oval adds a larger rebounding surface for more stability and more exercise options. The optic blue outline keeps you safe by giving you a visual reminder of the mat border. The resistance cords with padded handles let you get your upper body in on the action. Use the cords for rows, presses, curls and more to tone and strengthen your arms, shoulders, back, and chest. The padded handlebar adjusts to fit user's height, and adds stability and puts you in control of your workout intensity. For a more intense workout, you can release the handlebar and add a little bounce, for less intensity use the handlebar to control your bounce. The electronic monitor times your workout, counts calories burned, and number of jumps so you stay motivated and reach your goals faster. Because it is affordable, compact, and fun, the Oval Rebounder workout is a great way to add variety to a boring or high-impact aerobic routine, or to give you an ultra-effective, aerobic workout. The Intone Oval Jogger takes up a small amount of space and is easy to store out of the way when not in use. Work out with the Oval Jogger three, four, or five days a week and eating a healthy diet will help you reach your fitness goals for a healthy, toned body. Includes workout DVD featuring fitness expert, Ms. Olympia Mia Finnegan. The most Robust and High Quality Rebounder on the market, used by many Professional Athletes and Sports men and women for cardio and core training. Your deep core muscles are engaged involuntary allowing you to produce more core power which is vital for any sport. You will improve, speed agility, balance and coordination giving you the edge over your opponents on the playing field. FUN, STABLE JUMP: Bounce to your heart's content with the Stamina 36-Inch Folding Trampoline. 30 tension bands provide a safe, quiet, and supportive bounce. The safety pad covers the bands to keep you bouncing safely. FREE ONLINE WORKOUTS: Get the most out of your trampoline with 3 online workout videos. Videos include an introduction and 2 high-energy routines. DURABLE, HEAVY-DUTY DESIGN: The trampoline supports up to 250 pounds and is easy to assemble. Six detachable, rubber-tipped legs protect your floor space. 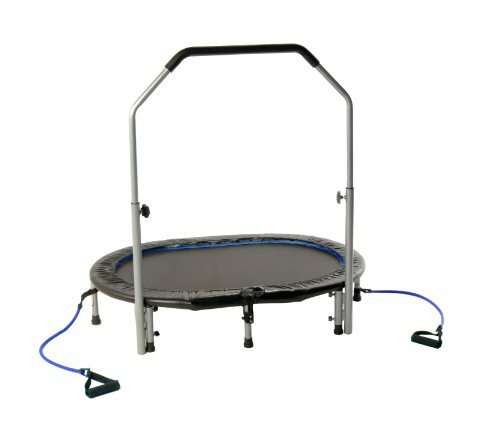 This is our 38'' Foldable Mini Band Trampoline which provides more convenience and fun to bounce and work out. It features sturdy construction and safe design. The whole frame and legs are constructed of rust-resistant and durable metal which maintains years of use. The six legs with protective rubber feet ensure stability and balance and protect floor from being scratched for indoor use. The jumping mat is made of high-resilience PP material and connected to the trampoline edge with many springs, which ensures your safety while you are enjoying your jumping time. It comes with thickly padded cover for its no-pinch springs and large rubber feet for stability. The foldable design is convenient for storage and maintenance. High Quality with competitive price can be realized here. It will be worthy of your choice! Protective Safety Pad Giving Dual Protection- The safety pad perfectly cover the trampoline round edge which protects users especially kids from scratching their hands by metal edge and prevent you from hurting your body when falling. High-Resilience Jumping Mat- The jumping mat are connected to the round edge with lots of springs which gives powerful support to the jumping mat and the whole trampoline. The jumping mat is made of high-resilience PP material and is spacious and flat, which makes you fully enjoy your jumping experience. Six Metal Legs and Detachable Rubber Feet- Six metal legs are evenly distributed and assembled under the trampoline can ensuring Safety and Balance. This greatly disperse the weight from the trampoline and person jumping on it. The rubber feet make the trampoline to stand more stably. Easy To Assemble And Disassemble- Detailed manual and complete accessories gives you much assistance in assembling the trampoline well. Due to its folding design, it is also easy to disassemble it for storage with black carry bag. Indoor And Outdoor Exercise- The size of this trampoline is suitable for both outdoor and indoor usage, which enable you can enjoy your jumping time even though it is rainy.